The first glimmer I had that this might be an extra special holiday was when our son confessed that he wanted to come home for Christmas Day. I knew he was out of vacation days and wasn't expecting that. Suddenly I realized that it might be possible for our immediate family to spend Christmas Day together. Stiff competition at the chess table. And so we did. We began our day exchanging gifts followed by our traditional brunch. Homemade cinnamon rolls, scrambled eggs with ham and strawberry daiquiris were on the menu. Afterwards there were books to select, table games and the luxury of unhurried time together. Jesse smoked some pork and chicken which may become a new tradition. There were roasted potatoes, cream corn, crescent rolls and for dessert, pie. Sunday brought some inclement weather and more was expected. Still, we made it to church and brought pizza in afterwards so we could connect with extended family in town for the holiday. Shawn was scheduled to leave on Monday evening, but though the major snowstorm forecasted did not arrive, the weather was bad enough to cancel his flight. Next flight available? Wednesday! A call to his boss assured him that he was okay coming back then. "You prayed for this!" Mike accused me. But I hadn't even thought to ask for more time, it was just a "above all you can ask or think" type gift. As the week got closer to the new year, my brothers and their families began to arrive. We squeezed in a get-together with our cousins and my aunt and uncle. 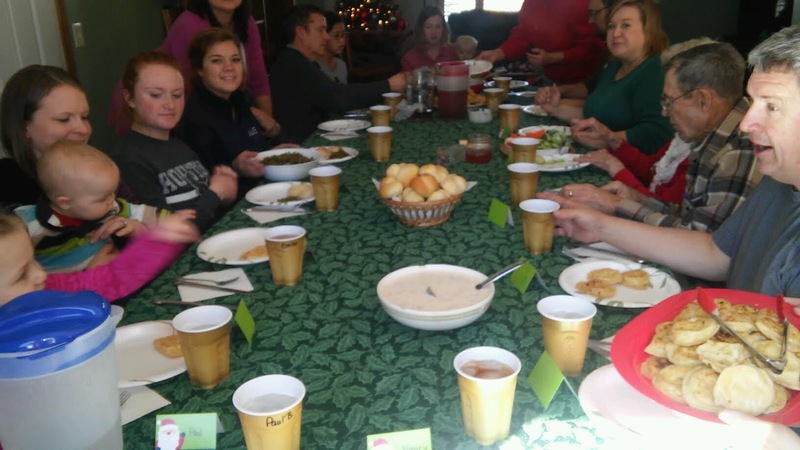 A potluck meal was followed by "sharing", something we rather dreaded during our childhoods, but somehow something to treasure now, as was singing "Joy to the World" together. On Thursday I spent some time with some sweet girls who used to be my neighbors but have since moved. They remembered where all the games were kept and we played most of them, even Old Maid, just for old times sake. I was going to make pizza for lunch when Alyssa said, "I always loved your sausage and potatoes." Well, sausage and potatoes it is then. That evening I hosted a soup supper. Before saying grace we sang "Great is Thy Faithfulness". It was beautiful. We celebrated my sister Nancy's birthday with an ice cream cake. (When I purchased two cakes at Freddies, the clerk asked, "Will that be for here or to go?") No one made it til midnight to welcome the new year and that was okay. Vereneke with ham gravy and zwieback is very tasty. New Year's Day brought our annual Vereneke Dinner. And this year there were zwieback and new year's cookies! This menu reflects our Low German Mennonite heritage and we try to serve it sometime over the holidays. The afternoon brought a gift exchange; numbers were drawn and each number had a Christmas question to add a little spice to the event (some gift stealing also takes place, but some of it is sympathy stealing when we think someone got a gift they don't really want). Afterwards there were hors d'oeuvres and lots of Christmas goodies to assure that everyone was properly stuffed. The burn pile was huge! Saturday was a work day. Dad's farm had been hit pretty hard by the Thanksgiving ice storm. There were fallen limbs and branches everywhere. Others had begun the job, but now it was our turn. Working with my brothers (and others) was fun. It was hard physical labor as we loaded hay wagon after hay wagon with branches and then unloaded those branches on a huge pile to be burned at a later time. My brother Paul sported a floppy hat he had found and asked for an opinion of it. "It displays a certain level of sophistication," said my brother David. What a perfect answer! We spent the rest of the day chuckling and thinking of how that answer could be used in all sorts of circumstances. We were able to spend some more time together on Sunday before everyone had to go their separate ways. On Monday as my brother and his daughters were preparing to fly home, our international student returned from a visit with his aunt's family. On Wednesday evening we invited our local sons over to celebrate Christmas with him with a pasta bar. Our dishwasher had died and Mike was installing a new one so there was no water and the kitchen was in chaos. Jesse brought water and somehow we managed to put food on the table. Gifts were exchanged and it was a nice evening. So ends the holidays for another year. I am left feeling grateful. Sounds like a perfect holiday, Bev! Here's wishing you and yours a blessed new year. !